I love my balcony. My requirement in an apartment was this outdoor space. I enjoy spending time sitting at my bistro set in the shade while the sun is shining. Bringing my phone, Kindle and/or netbook out there, I'll check out what's new on facebook, pinterest, blogs I follow, and possibly other websites. If I can hardly put a book down, then I will take either my Kindle or the actual book. I might sip a glass of red wine after 5. Another beverage or snack may accompany me as well. In addition, I adore entertaining on my balcony. 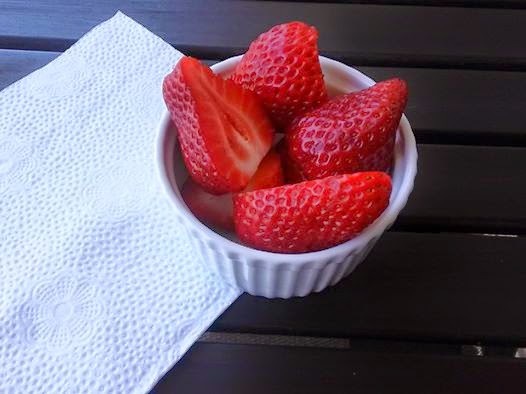 A snack of strawberries in a small ramekin back on April 21st. On Monday night, to add to my enjoyment, I decorated. I put a new plant in each of my two terra cotta pots, a red geranium and a dark pink azalea that I picked up at Home Depot during the afternoon the previous day. I also hung my "Italian" lights from Target, a string of clear round globes. Finally, I placed four little adhesive pads on the bottom of another recent purchase, my Italian (or even French...) urn, so I could use it as a beverage holder anywhere, even on the tabletop or a spare chair. As the purchase of this item was on my spring to do list, I will show off the urn in another post. The dark pink azalea, my favorite flower. I would love to line the balcony railings with potted flowers, plus use plant stands or different planters for varying heights, but so far, this is what my budget allows, and I hope to move anyway. I think it still looks very nice. On Tuesday, I prepared burgers and fries for my neighbor friend Mike and myself. We dined on my balcony. It was 70 degrees and there wasn't a cloud in the sky. It was very nice. We even lingered after we finished eating. Unfortunately, it has grown warm since and will only get hotter. I prefer staying in the AC during heat waves when it is around 90. I look forward to spring-like temperatures returning on Wednesday and hope to use my balcony a lot for the remainder of the season. Hopefully, I'll have a balcony or rooftop deck on my new apartment in Philadelphia if/when I move there this summer. 400th Post: Grazie and Coming Soon!